How does the Christian respond to all the fear out there surrounding 2012? Dr. Hitchcock was invited to answer questions based on a book he has just published about the widespread speculation and even hysteria that the world will come to an end on December 21, 2012. The book is titled 2012: The Bible and the End of the World. 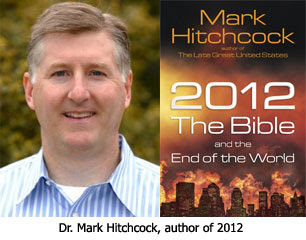 Dr. Hitchcock: How do we as Christians respond to those who are scared of the world ending in 2012? I think there are a couple of things we need to do as believers. First of all, when opportunities like this come up similar to when The Da Vinci Code came out teaching error and deception, I think we need to step in as Christians and take this as an opportunity to arm ourselves with the truth. We can bend the trajectory of all this fear and deception to God's purposes, using it as an opportunity. Go to people in your family and workplace and tell them the truth of God's Word. Secondly, and I think this is one thing we all need to remember, this isn't just a trite cliché — God is in control. God has the future under control and God is taking it all somewhere. We as believers need to rest in that every day of our lives. We need to really believe that and let it sink down and percolate all the way down deep into our hearts and minds. Dr. Reagan: I like that point you just made. It is one that I make over and over to people because I think people really need to hear it. God is on the Throne. God still hears and answers prayers. He still has everything under control. Even when it looks like the world is out of control here, God has the wisdom and power to orchestrate all the evil of mankind to the triumph of His will in history. I'm always reminded by Psalm 2 that while all the political leaders of this world are shaking their fists at God and saying, "I will do what I please," God sits in the heavens and laughs. He laughs not because He's not concerned, but because He's got it all under control. When I see the world just falling apart at the seams, I think of Psalm 2 over and over, and I urge everyone to read Psalms 2 as it will be encouraging to them. Dr. Hitchcock: There is a name for God in the book of Revelation where He is called "The Almighty," in fact nine times. I call that name "The Prophetic Name of God." That name in the Greek means "God holds everything in His hands." God has His hands on everything. He is the Almighty, and I love that because as the old song goes, "He's Got the Whole World in His Hands," and He really does. In the Greek the word is "Pantocrator," which translates "The Almighty." God has His hands on everything. To me, that is the great comfort we can have when we look at this world today which appears in utter, out-of-control chaos. "What I have said, that will I bring about; what I have planned, that will I do." God has already accomplished His plans in His mind, and we can trust that we are in His hands. We are protected in His hands, and so as Christians we need to just give it all over to God. We worry so much because we want to control the situation around us, but we can't. We are too small, so we have to put our trust in God. Know that He is going to enact His plans and that in the end we will be with Him forever in glorified bodies in Heaven. That is where we need to focus our sights.